There are many things that make this menstrual cup special. 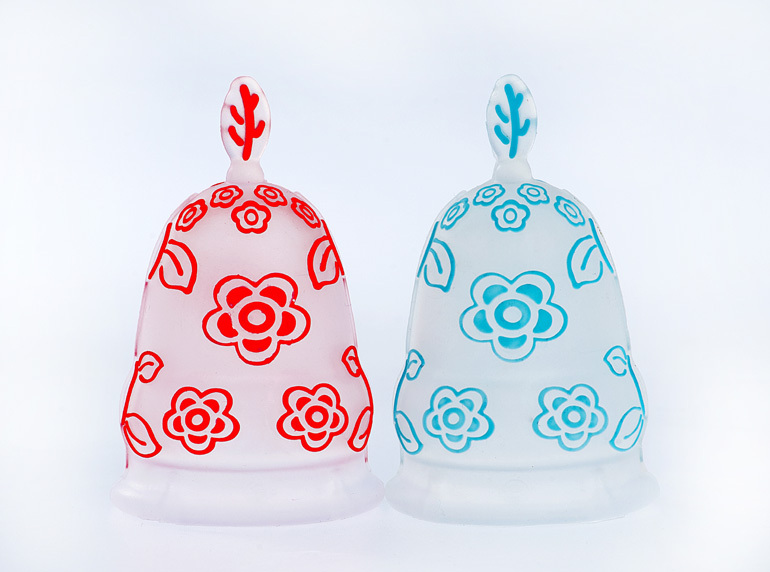 For one, these are among the most attractive menstrual cups available. Not only do they come in a variety of colors, they are the only cups that come in several patterns as well. They accept paypal in USD and will ship worldwide, so look no further if you are looking for a beautiful menstrual cup, look no further! These cups, made in Nigeria, are made of FDA-approved medical grade class VI silicone.The cup is the familir bell shape but has a large hump-like ridge toward the top of the cup and a flat stem. The cups come in three sizes. They recommend the smallest for light flow or teens; medium for light to medium flow or low cervix; large for moderate to heavy flow. These cups do have a relatively large capacity compared to similar cups, so if you have a very heavy flow these cups may be for you. It is approved both by the FDA and by Control Nigeria.